The Warped World of Koreyoshi Kurahara kicks off with a bang. 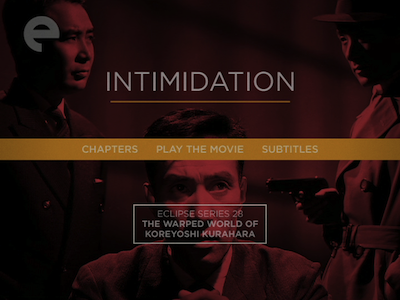 Intimidation (1960; 65 minutes) is a tight crime thriller, a story of blackmail and double-crosses that is sometimes called the first Japanese film noir. (As always, the use of the tag is debatable; I think Hitchcock's Rope , or his TV show , is a more apropos reference point.) 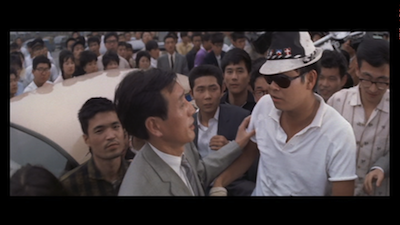 Bank manager Takita (Nobuo Kaneko) is heading to a promotion at the main branch--coincidentally, run by his father-in-law--when a local gangster (Kojiro Kusanagi) threatens to expose some bad loans he extended himself unless Takita pays him 3 million yen. He suggests Takita rob his own bank, since no one will ever suspect the boss of thieving. Seeing no way out, Takita tries to pull of a late-night heist. Despite his best efforts to keep him out of it, Takita's assistant Nakaike (Akira Nishimura, The Bad Sleep Well [review]) gets tangled in the burgling. Nakaike has been under Takita's thumb his whole life. 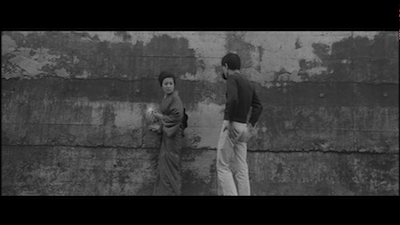 The other man jilted Nakaike's sister, Umeha (Mari Shiraki), to marry Kumiko (Yoko Kozono), who was Nakaike's girlfriend at the time. Had Nakaike married her, he'd be in Takita's professional position; instead, he warms the man's sake. Insult to injury, Takita is still having an affair with Umeha. We see a predatory chain running through this community: Takita may be intimidated by a crook, but he has been intimidating Nakaike in one way or another their entire lives. When you think about it, that's a lot of backstory for a movie that barely crests an hour in length, but Kurahara has wound these things so tight, you'd barely notice. 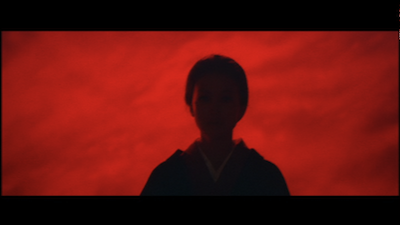 The screenplay is by Osamu Kawase, from a story by Kyo Takigawa, and Kurahara stages their material with precision. 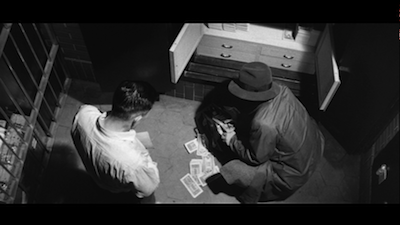 What at first appears to be mannered social drama quickly gives way to pulpy twists and turns, with the actual bank robbery staged in nail-biting silence, like a more direct take on Dassin's safecracking in Rififi [review]. From that point on, the change-ups come pretty quick. Pardon the referential joke, but it's all downhill from there. 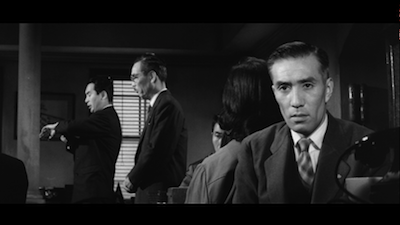 Kurahara and cinematographer Yoshihiro Yamazaki compose elegant shots, arranging the actors throughout the scene to emphasize their hidden relationships, while using tight close-ups to underline their anxiety. Intimidation is a sophisticated genre exercise that will keep you guessing right up until the memorable final moments. It's a movie where no one gets what they want, where all selfish intentions yield empty results, and innocence is as ephemeral as a flame from a lighter. It begins like any number of 1960s love stories, with two career-minded lovers juggling work and romance and failing to find a balance. Daisaku Kita, played by matinee idol Yujiro Ishihara, is a popular media personality who hosts a TV show that finds the true stories behind the most intriguing classified ads of the day; his manager, Noriko (Ruriko Asaoka), builds him a packed schedule day in and day out, but never fails to book time for their personal engagements, just the two of them. The business partners have been dating for exactly two years--or as Noriko counts it, 730 days--but their passion is waning, largely because they have been denying it. Wooing is fine, but hands off, buster! Like I said, this all plays like a glossy Hollywood love story. Even the zippy music by Toshiro Mayuzumi (Reflections In A Golden Eye ) would fit right in on the MGM lot, soundtracking the latest coupling of Doris Day and Rock Hudson. 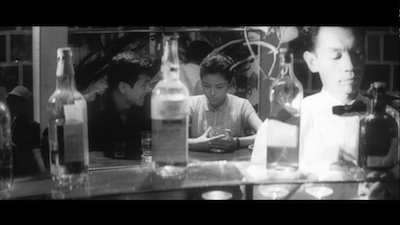 I Hate But Love takes a strange turn, however, when the frustrated Kita impulsively agrees to go on a cross-country road trip to fulfill the wish of one of his news subjects. A long-distance love affair between an average woman (Izumi Ashikawa) and a country doctor is about to bear fruit in an unusual way: the woman has saved up to buy the doctor a jeep so he can help more sick people who might not have access to health care otherwise, all she needs is someone to volunteer to drive the vehicle to the mountain village he calls home. 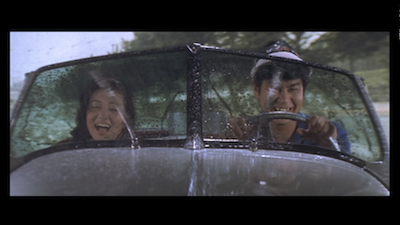 Eager to prove that love is real and affirm his own humanity in the process, Kita jumps behind the wheel. 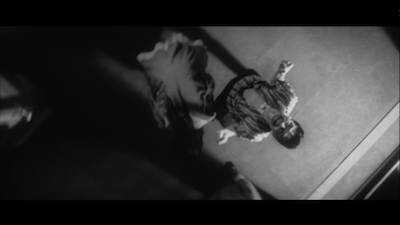 Seeing it as career suicide, Noriko chases after him. What follows is a cross-country journey on which the philosophical implications are only outweighed by the media circus that erupts around it. The farther Kita goes, the more fraught his journey becomes; as he grows more determined, Noriko gets more frazzled. It all builds to an oversized climax that has ironic consequences and surprisingly affirmative results. This topsy-turvy relationship is a distorted foreigner's version of The Defiant Ones . 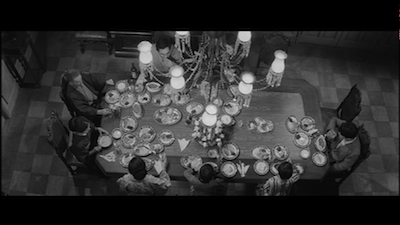 The scenario not only speaks to race relations in the 1960s, but also to the tension between Japanese citizens and the Americans, who are squatting in Mei's ruined country just as much as he is living in one of their abandoned churches (a harsh symbol when you consider all the implications). When Gill and Mei hit the road and realize that there is no turning back, the military police have identified both of them and their car, the two men begin to come together, finding that their common bond is that they are being abused by the same white institutions. This all leads to yet another of Kurahara's surprising conclusions. I don't want to give away what causes that scream I referenced earlier. I guarantee, you won't see it coming. 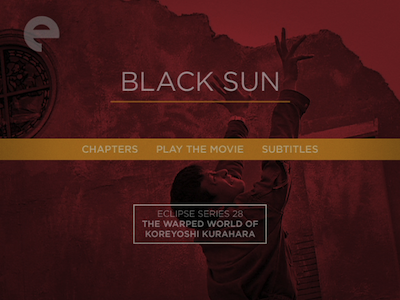 The Warped World of Koreyoshi Kurahara - Eclipse Series 28 lives up to its title. 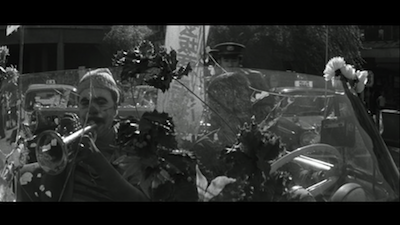 The five movies here really do show a self-contained image, like a Bizarro World inside a cinematic bell jar. 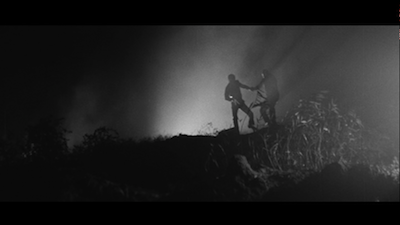 Kurahara's vision of post-War Japan is one where an occupied people struggle with class structures and a lack of opportunity, resorting to drastic measures and selfish gestures. It's a crazy scene, start to finish, and you'd be hard-pressed to find anything quite like it on either side of the Pacific.